The airline Komaviatrans—which is owned entirely by the government of Russia’s Komi Republic—is carrying on negotiations with the State Transport Leasing Company (known by the Russian acronym GTLK) about the lease of Sukhoi Superjet 100s (SSJ 100s). Komaviatrans general director Aleksandr Ponomarev told Russian Aviation Insider that the formation of an agreement with GTLK, which is owned entirely by the Russian Ministry of Transport, is only in the beginning stages. Responding to questions about how many of the aircraft Komaviatrans is interested in using and when the carrier will begin their operation, Ponomarev said, “I am not sure; that is still being considered. If we begin [the operations of SSJ 100s], then quite quickly—perhaps by the spring or summer schedule of 2017.” According to Ponomarev, Komaviatrans has also been checking out other aircraft that have similar passenger seating capacities as the SSJ 100. The news came about last week that GTLK has proposed to lease SSJ 100 to Komiaviatrans after a meeting between the leasing company and leadership of the Komi Republic. GTLK notes that during the talks, the two sides discussed the perspectives of the development of the regional transport complex, and the role of aircraft leasing. In particular, the acting head of the Komi Republic Sergey Gaplikov expressed the desire of the regional authorities to modernize and expand Komiaviatrans’ fleet. “Komi has a track record of successful cooperation with GTLK; four L-410 aircraft were leased to the company in 2013 and 2014, and they demonstrated effective development of the air transport network in the region and the efficient use of the leasing mechanism itself. Currently, we are set on developing interregional flights,” according to Gaplikov. 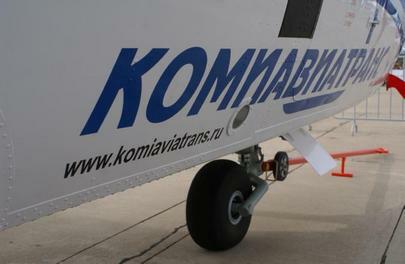 Today, there are five 50-seat Embraer ERJ145LRs in Komaviatrans’ fleet, in addition to L-410 turboprops. A sixth Embraer is planned to be added by the summer schedule of this year. At the end of 2015, GTLK began practical implementation of the program of operational leasing of Sukhoi aircraft. The airline Yamal is expected to take delivery and begin commercial operation of its first SSJ 100 in March of this year. Lease payments for the aircraft will be significantly reduced, as they are denominated in rubles. Lately, Komaviatrans has shown significant growth in its capacity. In January of this year, the airline took 32nd place among Russian airlines in the number of passengers carried. During that month, 12.3 thousand passengers used the airline—five times more than in January 2015.